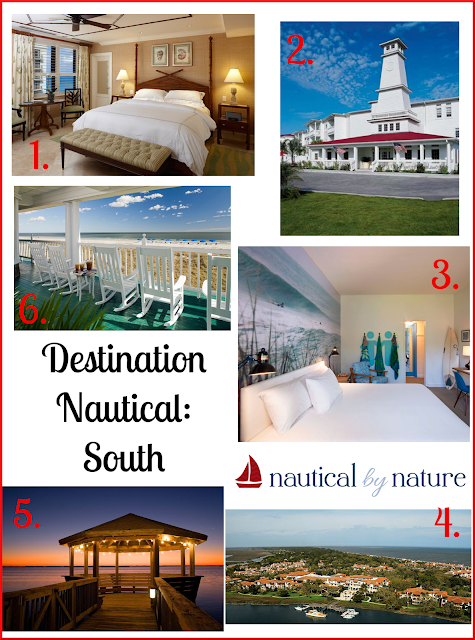 See my previous post on nautical destinations in the north east here. It's always hard to narrow down my long list of places I want to visit but I kept it at 6 (like with the previous post). For the purpose of this post I am considering Florida to be part of the south (as in southern United States). From the website: "A spectacular resort destination on Florida’s Atlantic coast, The Breakers Palm Beach, has lured generations of discerning travelers to its idyllic, Italian-Renaissance setting. Experience the irresistible charm and storied history of this legendary oceanfront resort, which seamlessly blends with an amazing range of modern amenities." From the website: "... a bayside gem on the beautiful Texas Coast. Relax and enjoy boutique accommodations and modern amenities, waterfront scenery, and our commitment to exceptional service. Our location is unbeatable on the coastal bay - you can’t get any closer to the water!" From the website: "St. Pete Beach’s Postcard Inn Hotel is located on prime beachfront on Florida’s West Coast, minutes away from downtown St. Petersburg and a short drive from Tampa. From decor to dining this St. Pete Beach hotel is the Gulf Coast’s Great American Escape. Each room is a uniquely accented throwback to a time when road trips ruled and surfers were kings." From the website: "From its inception, The Cloister at Sea Island has been defined by legendary elegance...Surrounded by the splendid natural beauty of the Georgia coast, Sea Island provides its guests with an extensive variety of experiences, including five miles of private beach, casual to Five-Star dining, three championship golf courses, tennis and squash courts, children’s programs, fishing, boating, water sports, shooting school, hunting preserve, fitness center, and the 65,000-square-foot Forbes Five-Star Spa at Sea Island." From the website: "Oceanfront luxury. Toes in the sand. Romance. Natural Beauty. Beach, pools, restaurants and spa. Tennis, golf and practically any outdoor activity that you can imagine...Offering magnificent views of both the Atlantic Ocean and the Currituck Sound, our guests have the same unique opportunity to admire both a sunrise and sunset – both over water." From the website: "Twenty of the Pointe’s beautiful guestrooms are located in the Main House, an 1890s Nantucket shingle style Inn with a strong maritime theme... Our wide, comfortable porches surround the Main House and offer an ideal spot to curl up with a favorite book and enjoy the ocean views, the Florida sun and a delicious glass of lemonade." Love this. I live near Amelia Island, so I may have to check this out for a mini getaway! I love Rhode Island, because everything about the place just screams nautical. I love Castle Hill Inn. Gorgeous views, amazing food. As I sit here in the very cold Vermont. I am so happy to feel the sunshine reading your blog post. Nice job! I would love to be at any one of these places right now! I love this blog post! I grew up visiting the Sanderling and it is so beautiful! Lucky! It looks like a gorgeous spot! I am about to go stay at the Anchor Inn in Boca Grande, FL. Thought of you! With a name like that I am sure it will be perfectly nautical!